TAKE THE SOLO THEME PARK CHALLENGE! 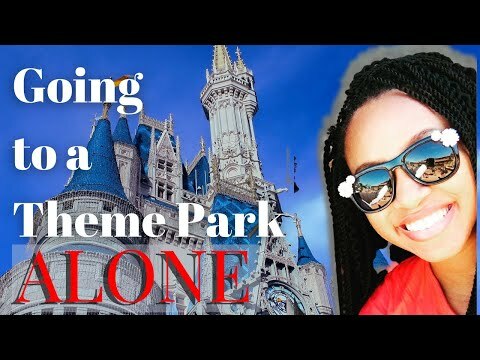 Theme Parks Alone Episode 1: Have you ever been to a theme park alone? Hey, ThemeParkHipster! Does any of this sound familiar? You set your theme park vacation goals but can’t find anyone to go with you. You have ideas and goals of the perfect vacation, but actually following through on them doesn’t happen because no one’s schedule lines up with yours. You feel overwhelmed, scared, and don’t know where to start. You’re working hard to save and plan for a theme park vacation, but it’s hard to think about doing it alone. You wish you had more advice on how to plan a solo trip, but not sure where to find information on it. You believe others will think you’re weird if you go solo; therefore, you never get the courage to book that trip. When you think about taking action, it’s usually short-lived because you’re afraid of criticism. You start planning and then you stop. The result is that you never get to where you really want to be, which is on a dope solo theme park trip! You get confusing information all of the internet and you spend most of the time piecing the info together. I know how you feel. You hop on the internet as a way to get information fast, but you realize that there’s hardly any information out there in one place that talks about going solo to a place like Walt Disney World or Universal Orlando Resort. This stops you from making your theme park vacation dreams a reality. You feel too busy to keep searching for answers when you may ultimately end up being super awkward walking alone in a theme park. You are busy and there’s not enough hours in the day to work on your solo vacation. You wish you could get everything done and be in a theme park already. You think why waste all this time planning a solo trip when you don’t want people to even realized you’re by yourself waiting in line for a ride. If these things ring a bell with you, then you’re in the right place! The Solo Theme Park Traveler’s Guide is designed to help you overcome these headaches. The Solo Theme Park Traveler’s Guide will show you how to take the leap and have the perfect trip with the best tips you never knew you needed! Helpful advice all wrapped up and a tiny little book package. Even though I live in Central Florida and hit the theme parks as often as possible you can always learn a little more. And this book actually has helped me a few times. I used most of the advice within the book and I always have it’s nice to see it in print. but not only does the book give the advice that I already have used in my life it also has taught me just a little bit more. I will carry it with me in my backpack as I travel from theme park to theme park. 1 – How to set your solo theme park vacation goals the right way. I will give you ideas and goals of how to jump start your vacation, with actual steps and tips. 2 – How to feel better with planning your solo trip and where to start. I teach you how to feel comfortable going to a theme park alone. My method focuses on giving you every insider tip I have learned along the way to have the best time on your solo trip. 3 – Ways to take action and drop excuses. When you finish this book, you will take action. This time it will not be short-lived. You will be armed and ready with knowledge to walk through the gates of the most magical places on earth. 4 – Find every piece of solo theme park vacation planning information in one place. You will be relieved to know there’s one place to find all of your trip planning tips. No longer will you get lost into the abyss of the internet searching website after website for the best tips and tricks. You will be one step closer to making your solo vacation dreams a reality. Part I includes six chapters with tips that teach you how to master your solo theme park vacation goals. Part II includes questions I’m frequently asked and key points to remember when it comes to going to a park alone. Part III includes extras that will help you succeed such as my favorite hotels, PRO resources and tools. 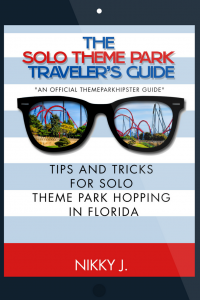 Get the paperback version of The Solo Theme Park Traveler’s Guide today for only $14.95 on Amazon now. Love this travel guide! Really well written and full of tons of helpful info for navigating Florida theme parks. 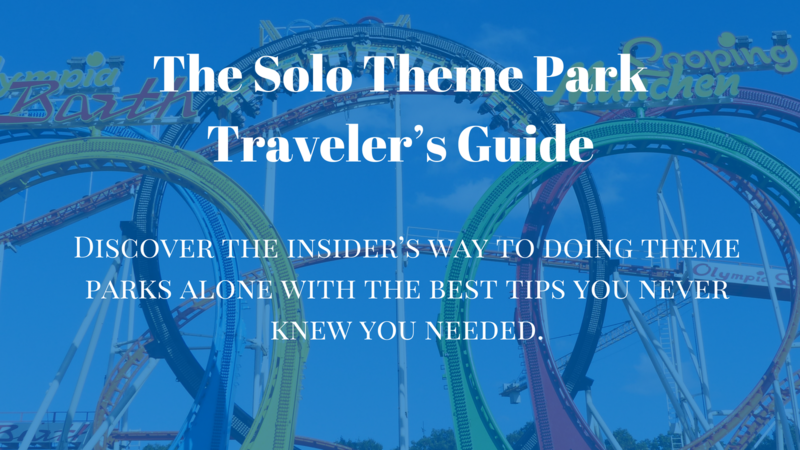 If you’ve been wanting to go to any of the parks solo and highly prepared, but you don’t know where to start, then The Solo Theme Park Traveler’s Guide is for you. It will teach you how to plan the perfect trip with proven tips. If you are someone who works hard and wants to vacation just as hard, but can’t seem to find anyone to join you, then The Solo Theme Park Traveler’s Guide is designed for you. This will help you learn ways to drop the excuses and do solo theme park traveling like a pro. If you believe that solitude actually brings freedom, then you are going to love The Solo Theme Park Traveler’s Guide. It’s a way for you to create a plan and understand the freedom of solo travel so that you can have your dream vacation. If you’re not into putting a little effort into your vacation goal, then this isn’t for you. The Solo Theme Park Traveler’s Guide is a book that makes you take action! You won’t see any results unless you do the work. If you would rather leave your future up to someone else, then don’t buy The Solo Theme Park Traveler’s Guide. It’s all about having a solo theme park trip so you will hate it. If you like to read but you don’t ever take action, then this is not for you. If you can’t see yourself actually writing down your vacation goals and taking action, then this is not for you. This ONE-TIME payment of $12.95 gets you access to do the eBook right away! Great book, well written and very easy to read. I find myself taking it with me whenever I go to Disney or Universal parks by myself. I love the tips and find myself trying new things that I never the parks had to offer. I definitely recommend this book to other solo Theme Park travelers. I’m a wife, a mother, a pharmacist turned theme park blogger, and a writer who loves ALL things amusement park related! I was born and raised in Florida, which attributes to my theme park love and passion. Ever since I was a child I had a natural affinity to the parks here that has now spilled over into adulthood. Instead of rushing over to the thrill rides, like I used to, you may find me in the Italy Pavilion at Epcot enjoying a nice glass of wine and a delightful book! This constant traveling to theme parks, along with my love of writing, birth ThemeParkHipster! I’ve been wandering alone to theme parks around the country for about a decade now logging in thousands of hours with this form of exploration. 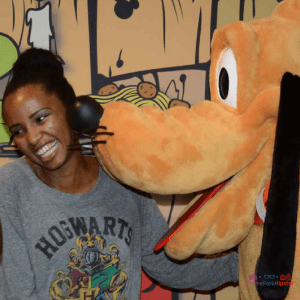 The solo travel started with the grand opening of the Wizarding World of Harry Potter unexpectedly, because I could not convince a single friend or family member to accompany me for twelve hours in the blazing Florida heat for a theme park event. After that day, I was hooked! Theme parks are my passion! …and ever since then I have enjoyed solo adventures throughout the parks learning new ways and fun hacks into making the best of each visit. In The Solo Theme Park Traveler’s Guide book, I will teach you how to enjoy theme park hopping alone in a simple and easy way. This lighthearted handbook will dispel the myths of going to theme parks alone and will inspire you to create your own solo theme park memories. You don’t have to leave it up to chance. I can teach you exactly how to get the results you want with the best tips. It helps you plan your trip better, save money and have an overall great theme. Very helpful!!! Especially for those who have no clue what all you can get out of a theme park, It helps you plan your trip better, save money and have an overall great theme park experience. In the simplest terms – what the heck is this?! This is an eBook or paperback book (depending on which one you order) that is informational. The first half is Part I, which is the actual eBook, where I give you tips and reasons for planning your solo vacation. Part III is made up of extras, such as top resources and recommendations, that I use and will help you excel and get the results you want. How is The Solo Theme Park Traveler’s Guide different than other theme park books? The Solo Theme Park Traveler’s Guide focuses on proven first timer tips that help alleviate the stresses of theme park hopping alone. Most other books focus only on general information whereas this book give actionable detailed items to get started quickly. Is this eBook editable or does it need to be printed? 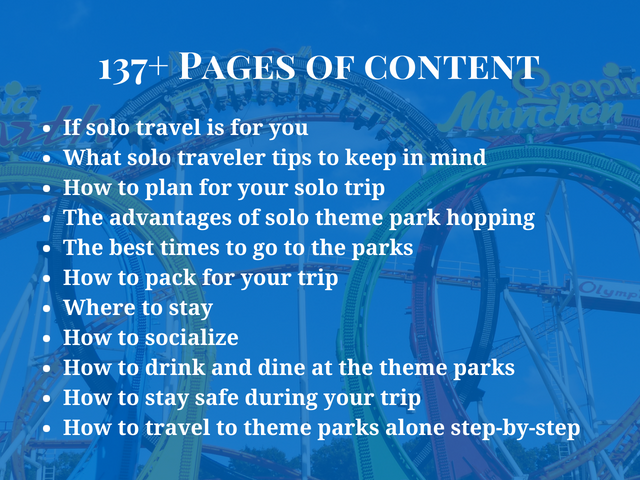 The Solo Theme Park Traveler’s Guide eBook can be printed and is not an editable PDF. How will I receive the eBook or paperback book? The Solo Theme Park Traveler’s Guide is a digital download. As soon as you purchase The Solo Theme Park Traveler’s Guide, I’ll send you an email. The email will have a link for you to click to download the eBook. You can read the eBook on your phone, computer, or other electronic device. You can also print it. The paperback version will be mailed to you via Amazon fulfillment. Yes. You can pay with credit card or PayPal. It’s as safe as buying anything online. Click on this link which will direct you to the contact page, and I’ll chat with you and answer your questions! How to plan the perfect solo theme park vacation with the best tips you never knew you needed. Buy eBook Now For $12.95!